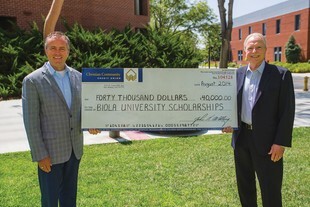 LA MIRADA, CALIF. — Biola University has formed an alliance with Christian Community Credit Union, who has committed giving $240,000 to Biola for student scholarships over the next five years, starting with a $40,000 donation given on September 30. “Thanks to Christian Community Credit Union Union’s generosity, our joint efforts will help in making a Biola University education more attainable for future generations of students,” said Biola University President Dr. Barry H. Corey. The affinity card program, titled the Benefits of the Biola Signature Rewards Visa, was made available November 2014, and will help support Biola student scholarships. Furthermore, for every new Biola Visa card, the Credit Union will donate $100 to Biola University to help fund scholarships. Each time a Biola Visa cardholder uses the card for purchases, the Credit Union makes an additional donation at no cost to the cardholder. The card includes no annual fee and contains zero percent Annual Percentage Rate (APR) introductory rate for the first 12 months on purchases. This exculsive offer is extended to Biola alumni, students and their families, staff, and other Biola supporters, about which full details are available online at at myCCCU.com/BiolaOffer. To help fund scholarships, visit myCCCU.com/BiolaOffer or call 844.GO.BIOLA (844) 462-4652.